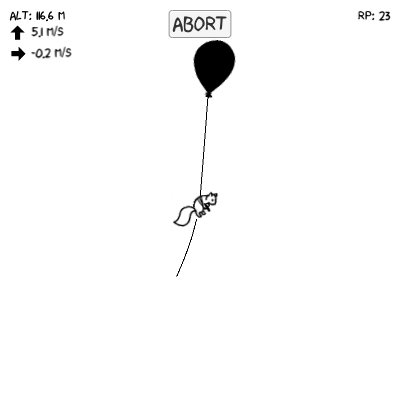 A physics based game where squirrels try to reach the sun with balloons. Many of the sprites come from xkcd comics. The game was nice, nothing exceptional. Controls in "construction mode" are really unclear. It took me a while to realise I could actually place multiple balloons. After the weather balloon is unlocked, it's really a matter of how many you can fit at once, at which point I was able to go above ~50km height. I hope you eventually update the game to include the information that's in the description--there's a lot of important stuff in there. . . Does the eraser work? I tried using it, but it wouldn't, well, erase anything. I see this is an issue for other commenters as well. 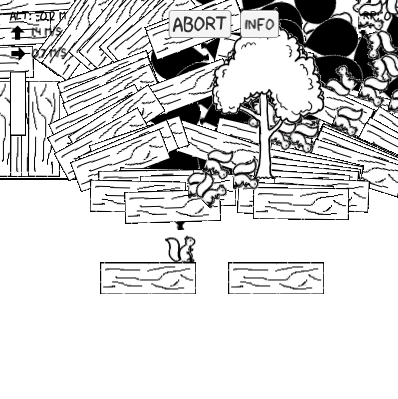 Another issue I had that other commenters also had: it's not clear that the squirrel needs to be placed on the ground. I thought the squirrel-placing-button was broken until I skimmed the comments. Sooooo . . . yeah. No idea what the issue is there. I still got a lot of research from it though, and was able to invest in more materials. I invested in wood (why can you only put down 3 planks of wood at a time? ), and then this happened. The game keeps exploding. It is my browser (Chrome)? Is it a glitch? 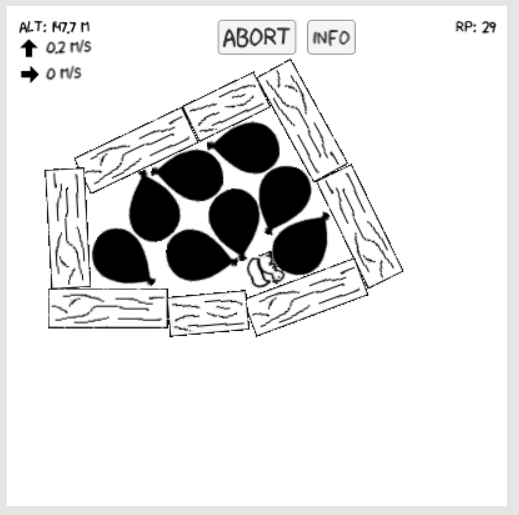 Read the comments again, and it turns out I have to put the balloon more than 1 tile above the squirrel. Ok? However, upon finally getting a balloon squirrel in the sky without exploding the screen, I noticed that the RP goes up very slowly. ~1 RP for every 5 miles (which drains away when the balloon breaks and the squirrel falls to the ground)--but I got 122 RP for glitching the game (twice) for a short amount of time. The intentional optimal way to play may be (at least in the early stages) to break the game for high RP. I'm sure that's not what you intended, but. Well, here we are. I'm sure the way to play this game is to create interesting ships and experiment with them. But when the ship tools are locked behind a slow unlock method, and building those ships is somewhat too challenging in and of itself (how do you put the wood together to make a structure? ), then I can't exactly do that. From what I've played, this is an interesting game with slow progression as squirrels are sent into the sky for the sake of nuts. But getting that progression is pretty slow (if played the normal way, I have to send a balloon squirrel in the air 5-7 times in order to unlock wood), and there's a glitch to get it a better way that needs to be fixed. Also there's no music or sound effects, which really would've enhanced this game. I'd like to see an updated version of this. As it stands, this game is ok. Thanks for trying so much with my buggy incomplete game. I'm disappointed with the state the game is in now, but I think some small changes, many of which you have pointed out, will substantially improve the game. I hope you'll try the post-jam version. 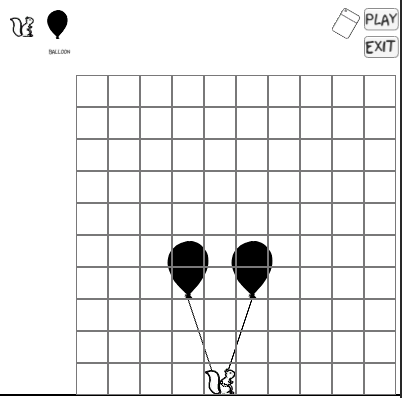 Not sure how to play this, as I attached the balloon to the squirrel but upon pressing play the squirrel goes to negative altitude and the screen is total chaos. Sorry about the bug. I think I was able to replicate it. It seems to occur if you place the balloon in the tile immediately above the squirrel. I'd love for you to try the game again. 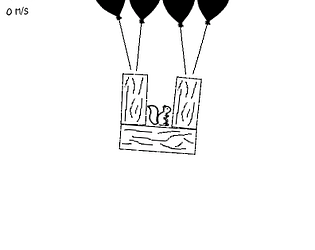 Just place the balloon further above the squirrel in the ship constructor. If it is still bugged, I'd love to have more information about it so I can fix it for the post-jam version. Played it again and that fixes it. 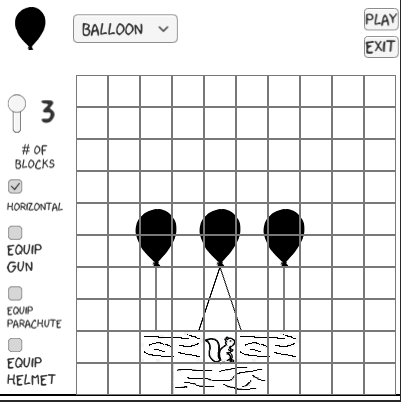 Great balloon physics, reminds me of bad piggies in some way. There's quite a bit of potential to this idea, but it was tedious to earn RP and its a little weird that you can't invest in a hot air balloon right away. 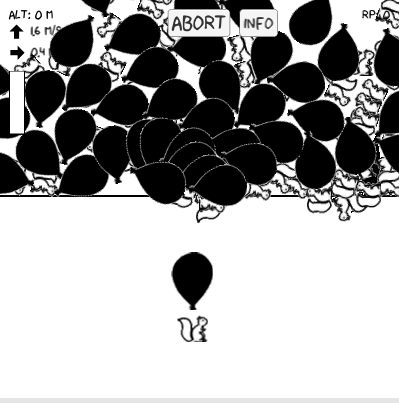 Would be great if there was some way to steer the balloon to avoid the birds making it more of a game requiring some skill, but now its more of random chance whether you get hit by a bird and plummet to the ground. Absolutely love this. I love "put things together and see what happens" kinds of physics games. Really hope you continue to tweak things and fix the things you meant to. A suggestion - I'd love it if RP saved your max so you don't have to abort. I enjoy watching the squirrel fall comically down. It'd also be nice if balloons automatically exited "connection" mode after you've connected them, just because it's a little awkward and I tend to forget even though I know better. It'd also be cool if you could save ship designs so you can modify them or try again, but that's more a request and I know that'd be too much work for a jam. Thanks! I love your ship. Thanks for the suggestions. I had planned on a save feature for the ships, but that was quickly scrapped when I started running out of time. The connection mode for the balloons was definitely a mistake. 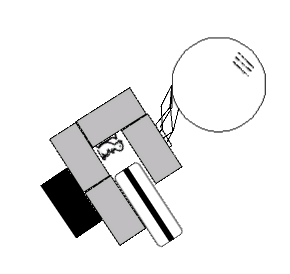 However, the reason it doesn't automatically turn off is that you might want to either connect one balloon to multiple objects or to not connect the balloon at all. This will definitely be clarified in the post-jam version. oooh, I didn't realize you could connect to multiple. Need to try that. Maybe a visual clarification could be drawing a line from the balloon to your cursor, if possible? Well worked and funny, but the instructions can be improved (for example, it's not clear that you tie objects by clicking them). Also, RP are gained too slowly; I stopped playing because it seemed to me that I would need too much time to finish the game. However, this may be because I'm rushed to try other games of the jam. You may want to explain that the squirrel may only be placed on the ground. I am unable figure out how to earn RP and cannot get the eraser to work. Will wait for explanation before rating. Thanks, I'll add the explanation about the ground to the game's info. As for RP, it is earned by gaining altitude. Unfortunately, in order to save the rp you've gotten during a mission you have to abort before you fall back to earth. So, to gain RP, go up high and then abort the mission. As for the eraser, make sure that after you've placed a balloon and tied it to everything that you want to tie it to, you press 'space' to stop tying the balloon to things. This has to be done before any other tool can be used.